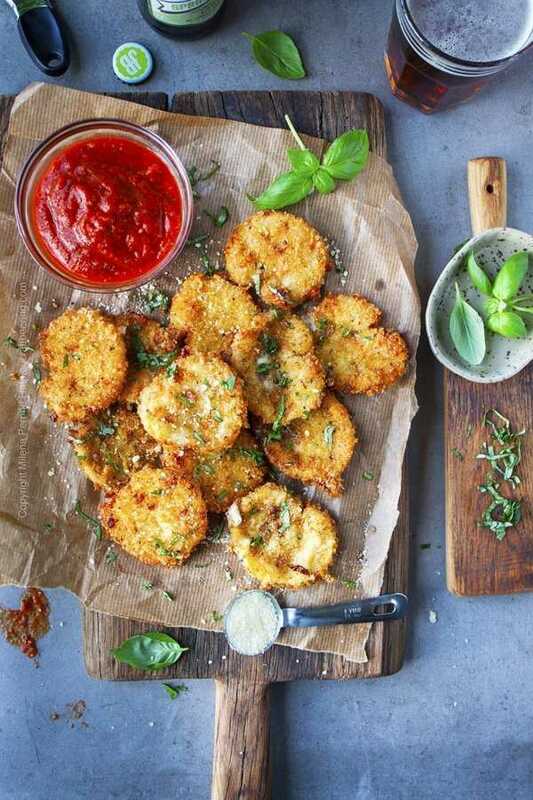 Fried mozzarella cheese appetizer consists of a crispy, flavorful coating hugging gooey cheese. Add a side or marinara for dipping, some fresh basil for garnish and a cold beer and life is good! This easy recipe works great for all types of mozzarella shapes. Use it to make little fried mozzarella balls (aka pearls), mozzarella sticks, or our favorite – round slices. Because they appear to have the highest gooey-ness factor and ‘stretch the farthest‘ as our son remarks). We do recommend that you use fresh cheese, not the processed stuff that is often passed as it. Considering mozzarella’s very mild taste we like to infuse the crunchy outside with as much flavor as possible. Let’s talk ingredients. A log of fresh mozzarella cheese (pre-sliced if you find it, we usually get ours at Trader Joe’s). Flour for dredging (plus salt and pepper to season it). Eggs and a bit of water for an egg wash (we like to add a bit of sweeter lager such as maibock or helles instead). Bread crumbs (we like to use Panko for the extra crunch). Parmesan cheese (grated) to flavor the bread crumbs as well as some dry oregano or basil, or both for the same purpose. Consider red pepper flakes if you’d like to add heat. Fresh basil, finely chopped adds a bright herbal note as garnish if you choose to use it. You will also need a frying pan and cooking oil – enough to fill the pan about an inch deep. A fish spatula or a similar flexible utensil is very useful to flip the mozzarella rounds after pan frying them on one side. Finally, a cooling rack is helpful to rest the fried cheese rounds on. TIP: This is the kind of appetizer you need to serve as soon as you make it so it is very helpful to have everything set up before you begin. Prepare your serving dish or platter in advance, have your marinara and garnishes ready to go and then get to work. To eliminate any unnecessary stress from the process, first prep the cheese for pan frying. Set up a standard breading station by mixing the flour, salt and pepper in one bowl (#1), the egg wash in another (#2) and the bread crumbs and Parmesan mixture in a third (#3). Next proceed to bread your mozzarella slices (or balls or sticks) by dredging them in flour first (#4), then dipping them in egg wash (#5) and finally giving them a good coating of seasoned bread crumbs (#6). You can place them onto a cutting board or sheet pan as you go (#1 image below). To fry the breaded mozzarella heat oil over medium heat to 350 F and place only a few pieces at a time (#2). Not overcrowding the pan helps maintain the oil temperature and results in more even frying. Fry each side until golden brown. 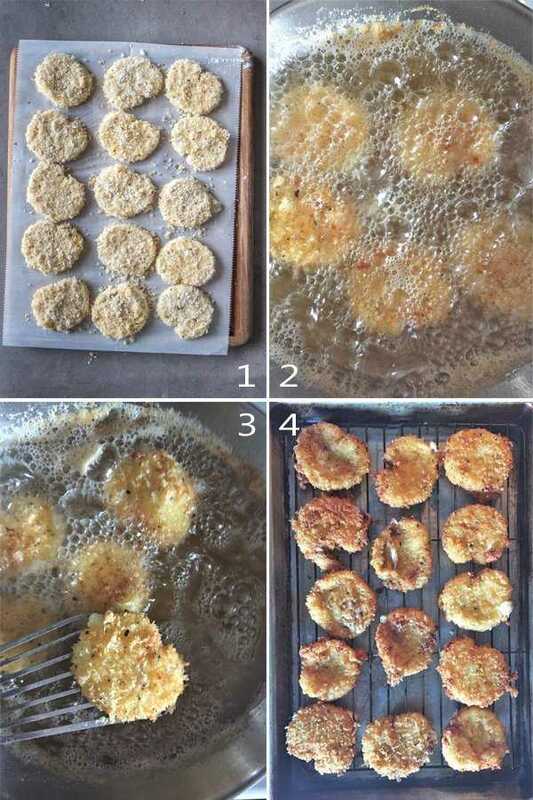 Carefully flip over using a flexible utensil such as a fish spatula as the melted cheese inside the breading is quite delicate (#3). TIP: Do not place the fried mozzarella rounds directly onto paper towels after frying. Chances are that some awesome melty cheese oozed from the casing and it will stick to the paper. Use a cooling rack instead (#4). As soon as you are done frying the last batch – serve with a side of warm marinara. Garnish with fresh basil and dust with grated Parmesan. 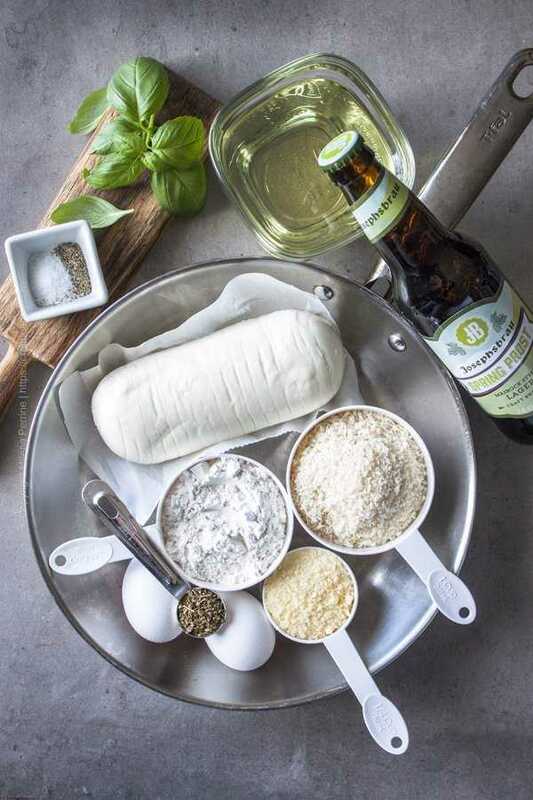 Because we always have craft beer on the mind we have a few suggestions for most compatible styles to pair with fried mozzarella. Biscuity, bready notes accompanied by herbal, grassy, floral zing and good carbonation absolutely elevate the fried mozzarella munching experience. You will not go wrong with crisp lagers such as German pilsners (especially the bitterer varieties of the North), Kellerbier, sweeter Czech pils or Munich Helles, light bocks and Maibocks. Along these lines we also recommend Kolsch ale. Highly effervescent wheat ales, from the fruity German and Belgian ones to the clean American yeast styles are also well suited. Saisons – the most food friendly ales of them all, or golden Belgian ales will never fail you as a partner to these cheesy bits of fried delight. And if you happen upon a refreshing grisette, do try. Among the IPAs our first choice are the milder English ones. From the myriad of American varieties we like the more balanced and dry-hopped versions. 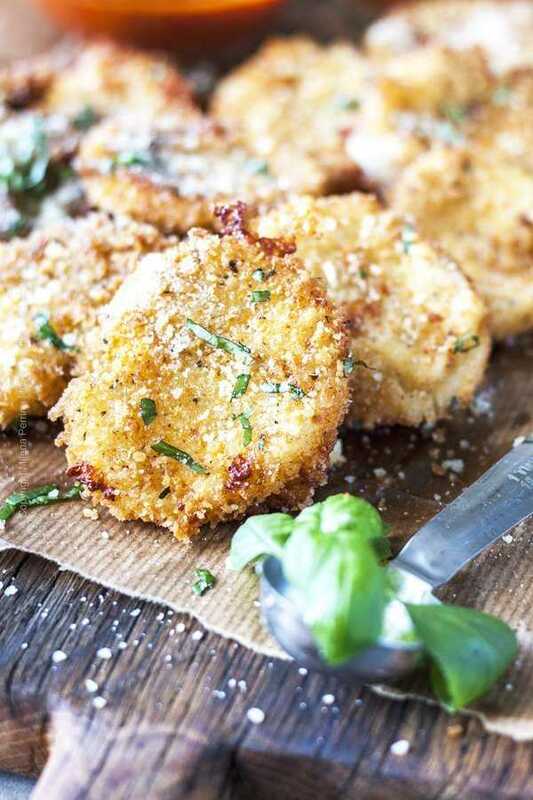 Gooey fried fresh mozzarella cheese encased in a light, crispy and flavorful coating of bread crumbs, Parmesan and spices. Use this recipe to make fried mozzarella balls, rounds or sticks. Serving size is 4 oz of fried cheese per person. Set up a breading station - in one bowl mix flour, salt and pepper, in a second bowl beat the eggs and water (or beer or milk), in a third bowl combine the bread crumbs, dry oregano and Parmesan. Slice the cheese into about half inch thick pieces (or use pre-sliced rounds). Dredge each in flour, shake off excess, then dip in egg wash, let excess drip, and finally coat with bread crumbs mixture. Place the coated mozzarella pieces on a parchment paper lined cutting board or a baking sheet and set aside. Pour cooking oil in a frying pan (about an inch deep) and heat to 350 F.
Maintain even cooking oil temperature ( 4-5 pieces of cheese at a time). Add a bit more cooking oil in between batches and let it come to temperature before frying more cheese. Serve immediately with a side of warm marinara and garnish with fresh basil and a sprinkle of grated Parmesan. *Mozzarella balls (aka pearls) or sticks can work as well. **Flip using a flexible utensil such as a fish spatula (the melted cheese fritters are very delicate). 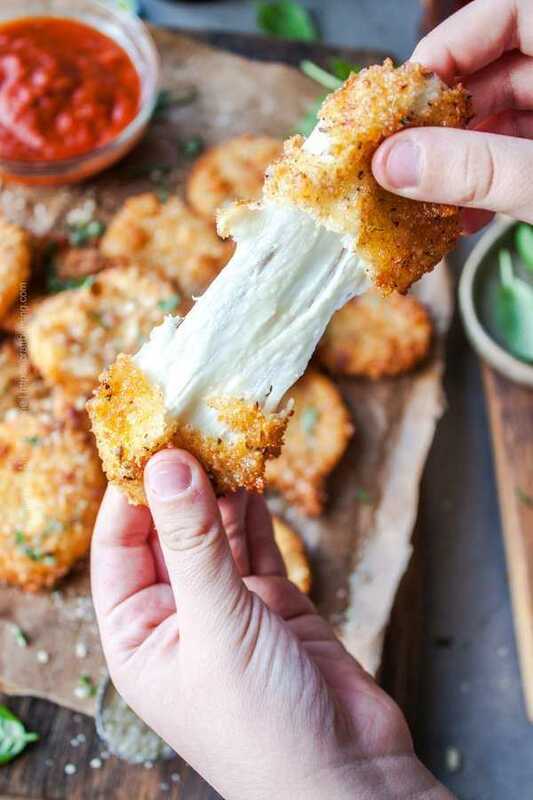 When done frying gently set each fried mozzarella piece onto a cooling rack to avoid cheese that has oozed out of the casing sticking to any paper towels. They combine two of my favorite things: mozzarella and deep fried food. I don’t think it can get any better than that. well, maybe a cold beer on the side 🙂 . This looks extra delicious! Thank you for the recipe and the instructions! Can you coat the cheese and put the slices aside on the baking sheet for a while before frying them? How long would be ok to wait? I’m thinking maybe you could get them all ready, and then pop them into the pan while having your first beer with friends. Looks amazing, as always! Next time I get to frying, these are going in! Thank you for sharing this yummy recipe at Create, Bake, Grow & Gather this week. I’m delighted to be featuring it at tomorrow nights party and pinning too. Love this! Warm, ooey gooey cheese, breaded and fried. Does it get any better??!! This sounds totally delicious! Thanks for sharing. Have a great week! holly molly! They sure stretched pretty far!! 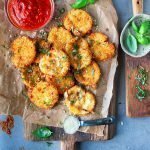 I love to snack on mozzarella and this is such a great idea and I will need to try it out!!! You know this has my name written ALLLLLLL over it! Creamy, gooey mozza and a crispy golden exterior?! I could eat the entire batch myself 🙂 Pinned! Have a great week! !